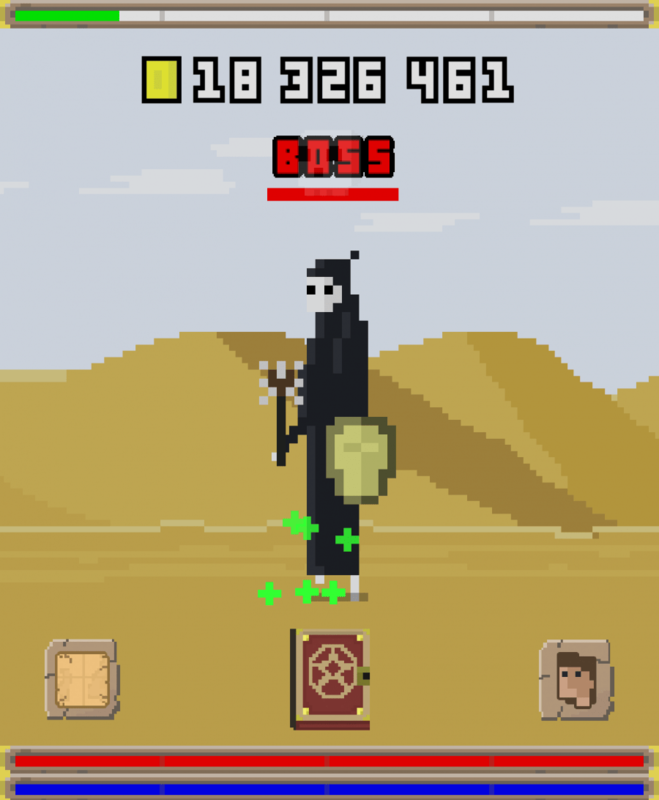 REVIEW - RPG Clicker - Use a Potion! The joys of incremental games, games where constant repeated actions such as tapping or clicking a screen mean progress. You could be collecting gold, candy or even cookies – there is always a form of currency you click/tap for that you can use to purchase upgrades or abilities, making the tapping and clicking all the more easier. They’ve been around for a while but it was 2013’s Cookie Clicker that saw their surge in popularity, which of course has resulted in the release of countless more incremental games. 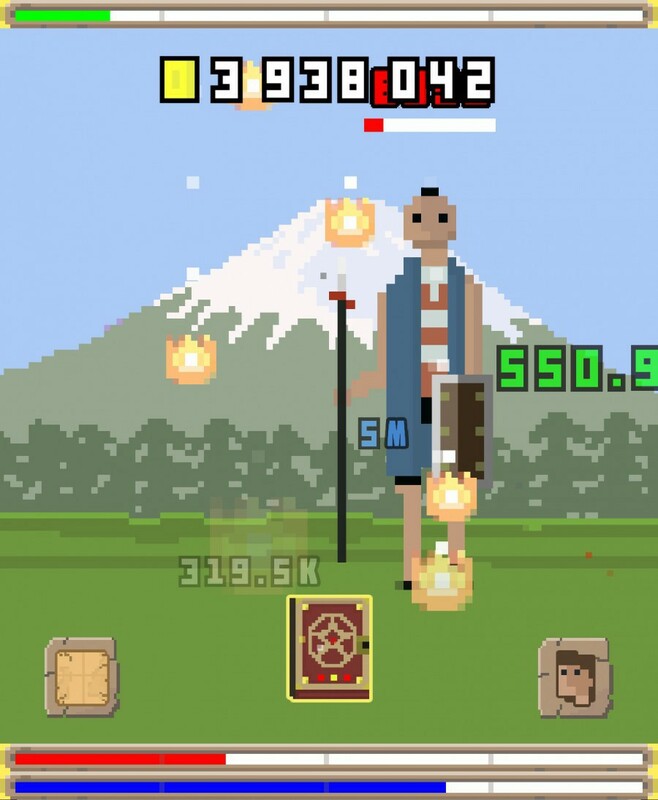 Epic Pixel’s RPG Clicker is one of those games, an incremental game set in a fantasy world with RPG elements – something the developer has described as the ‘next evolution in clicker games’. But does it manage to live up to that billing? It’d been unfair to judge an incremental game on it’s story – after all it is a game all about constantly tapping the screen. However, it is a shame that RPG Clicker doesn’t include any kind of back story. The story is usually the backbone of a RPG, so I was hoping that maybe there may be some context to the the clicking or some ultimate goal that you were working towards. The game has an 8 bit graphic style which works really well. Enemies are your typical fantasy game enemy with likes of knights and wizards confronting you. They are well designed and animated, bobbing on the spot awaiting your attack. Epic Pixel made sure to pay good attention to minor graphical details too, with pixels bouncing off the enemies with each attack and upon defeat them falling away and dropping their equipment. It’s small little things but the extra polish really adds to the graphical design of the game. Environments are also well nicely crafted, each one representing different locales featured across fantasy RPGs. There are 7 environments, each spread across 5 levels. It’s the shame that each level contains the same back drop – it would have been nice if the developer added a little variety to the environment across the levels, even something as simple as a day and night cycle would have added a bit more diversity. That being said it still offers more diversity than a lot of incremental games so it can’t be held against it too much. Disappointingly there is no music in the game. With the repetitive nature of the gameplay some good background music could’ve really added to the game. I think this is a real oversight on the developer’s behalf, and something they would hopefully rectify in future versions of the game. Fortunately sound effects are well used be it the metallic chimes of the swords or the booming claps of lightning. As mentioned at the start of this review, this game is all about tapping. Pretty much all of the game will be spent tapping enemies constantly until they are defeated. It’s the core gameplay element of any incremental game and it’s something that is, unsurprisingly, done well in RPG Clicker. There is a real addictive nature to the defeat of enemies by tapping them – its surprising how many hours you will lose simply tapping the screen. Each defeated enemy results in the gaining of XP and gold, the former used to level up your character’s abilities and the latter used to progress to the next level or purchase and upgrade weapons and magic. I felt the leveling up system wasn’t very well integrated – the benefits of leveling up seeming redundant compared to those of the upgrading of weapons and abilities. You’ll also come randomly come across treasure chests after defeating a certain amount of enemies, each chest containing a piece of equipment you can equip that can greatly improve your stats – much more so than leveling up will. It’s a real satisfying feeling finding a chest – getting that better piece of equipment and watching your stats boost gives you that urge to push on and tackle that next boss that has been holding you back. Each level of the game starts of with a boss that dictates the strength of the enemies in that level – if you can’t beat him you simply go to the previous level and grind out your taps until you improve your character enough to progress. The bosses aren’t epic boss fights but they still provide a stern challenge. Beating one is satisfying, the difficulty curve between each level is quite high, so when you do manage to progress it’s very rewarding. On many levels RPG Clicker didn’t deliver on my expectations – I was hoping for a lot more RPG elements to be integrated into the game. This didn’t stop me putting hours upon hours into the game though. It certainly has it’s flaws – a lack of environment variations and no music being the main ones – but nothing that will ruin the experience for the player. It isn’t the ‘evolution in clicker games’ I wanted it to be, but it’s still a great one. Because thats what RPG Clicker is, an incremental game, and on that front it really delivers. With it’s fast, addictive tapping gameplay RPG Clicker is something you will struggle to put down once you start playing. If you’re a fan of incremental games then you need to get RPG Clicker immediately – you will love it. Not played an incremental game? Then RPG Clicker certainly is a good place to start. Summary On many levels RPG Clicker didn't deliver on my expectations - I was hoping for a lot more RPG elements to be integrated into the game. This didn't stop me putting hours upon hours into the game though. It certainly has it's flaws - a lack of environment variations and no music being the main ones - but nothing that will ruin the experience for the player. It isn't the 'evolution in clicker games' I wanted it to be, but it's still a great one. Because thats what RPG Clicker is, an incremental game, and on that front it really delivers. With it's fast, addictive tapping gameplay RPG Clicker is something you will struggle to put down once you start playing. If you're a fan of incremental games then you need to get RPG Clicker immediately - you will love it. Not played an incremental game? Then RPG Clicker certainly is a good place to start.